As a central part of the circulatory system, the heart is primarily responsible for pumping blood and distributing oxygen and nutrients throughout the body. Because of this task, the heart may be considered one of the most important organs of the body, such that even small dysfunctions or abnormalities may cause drastic changes or effects in the human organism. The heart is a muscle whose working mechanism is made possible by the many parts that operate together. The organ is divided into several chambers that take in and distribute oxygen-poor or oxygen-rich blood. These chambers are accompanied by veins and arteries that facilitate the same function. With all of its parts working together towards the same goal, the heart successfully pumps blood with ease. Normally, a good-functioning adult heart could go on three cardiac cycles or 72 beats per minute. This rate changes for children whose heart rates are normally and relatively faster. The heart can be found at the center of the chest, underneath the sternum in a thoracic compartment. It is made up of four chambers and several valves that regulate the normal flow of blood within the body. Two chambers called atria are located in the upper portion of the heart and receive oxygen-free blood. The valves that separate these chambers are called atrioventricular valves which is composed of the tricuspid valve on the left and the mitral valve on the right. On the other hand, ventricles are chambers found on the lower portion of the heart; they pump oxygen-enriched blood into all organs of the body, reaching even the smallest cells. Similar to the atria, the ventricular chambers are also separated by valves. Collectively-termed as semilunar valves, these are comprised of the pulmonary and aortic valve. The heart also has a wall that is composed of three layers: the outer layer epicardium (thin layer), the middle layer myocardium (thick layer), and the innermost layer endocardium (thin layer). The myocardium is think because it is made up of cardiac muscle fibers. The structure of the heart is made more complex because of the mechanisms that allow blood to be distributed throughout the body and to return into the heart. Facilitating this continuous process are two types of blood vessels: veins and arteries. 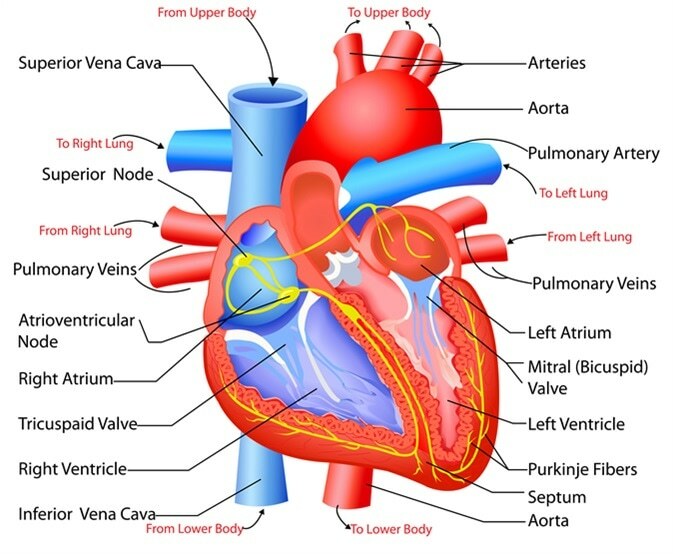 The vessels that bring oxygen-free blood back into the heart are called veins; those that bring oxygen-rich blood away from the heart and to other body parts are called arteries. Functioning in the left ventricle, the largest artery is called aorta. The aorta is considered a main artery in the body. It further splits into two smaller arteries called common iliac arteries. With regular functioning, the heart is continuously able to supply sufficient amount of oxygen to all parts of the body. The heart is the main organ in the circulatory system, the structure primarily responsible for delivering the circulation of blood and transportation of nutrients in all parts of the body. This continuous task uplifts the role of the heart as a vital organ whose normal operation is constantly required. The heart’s blood-pumping cycle, called cardiac cycle, ensures that blood is distributed throughout the body. The oxygen distribution process begins when oxygen-free blood enters into the heart through the right atrium, goes into the right ventricle, enters the lungs for oxygen refill and release of carbon dioxide, and transfers into the left chambers, ready for redistribution. About 5.6 liters of blood circulate the body and three cardiac cycles are completed per minute. The performance of the heart could now be easily monitored when any cardiovascular problem or disorder is suspected. For instance, a regularly abnormal heartbeat or beats per minute are characteristic of a heart-related illness. This is because a heartbeat is a manifestation of the oxygen-reloading process in the heart that is made up of two phases. The systole is a short period that occurs when the tricuspid and mitral valves close; the diastole is a relatively longer period when the aortic and pulmonary valves close. The systole-diastole relationship is the reference in measuring blood pressure. Other ways of physically determining the regular functioning of the heart is through examining the pulse rate (beats per minute). A normal heart rate of an adult is at 72 beats per minute, while children normally yield higher heart rates.